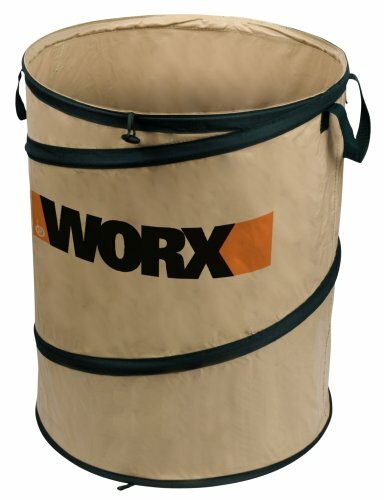 The WORX WA0030 26-gallon collapsible spring bag is ideal for collecting garden debris. Its substantial yet lightweight design makes it easy to collect, drag, and dump debris without yard bags ripping or toting heavy trash cans. The spring bag collapses down to 3-inches for easy reusable storage. It is a handy companion for other WORX products such as collecting mulched leaves from the WORX WG430 Leaf Mulcher or the Trivacs -- WG500 and WG502. The spring bucket is also great for collecting grass clippings, weeds, plant material, and cleaning out mulched landscape. The WA0030 26-galon collapsible bag is the ideal yard companion for cleaning, clearing, and maintaining the yard, garden, and landscape. The spring bucket is great for fallen leaves, grass clippings, weeds, plant material and more.